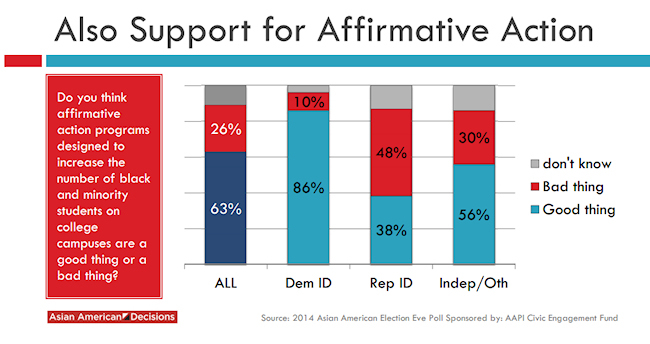 Findings by Asian American Decisions, which support the findings of the APIAVote/AAAJ-AAJC 2014 National Survey. 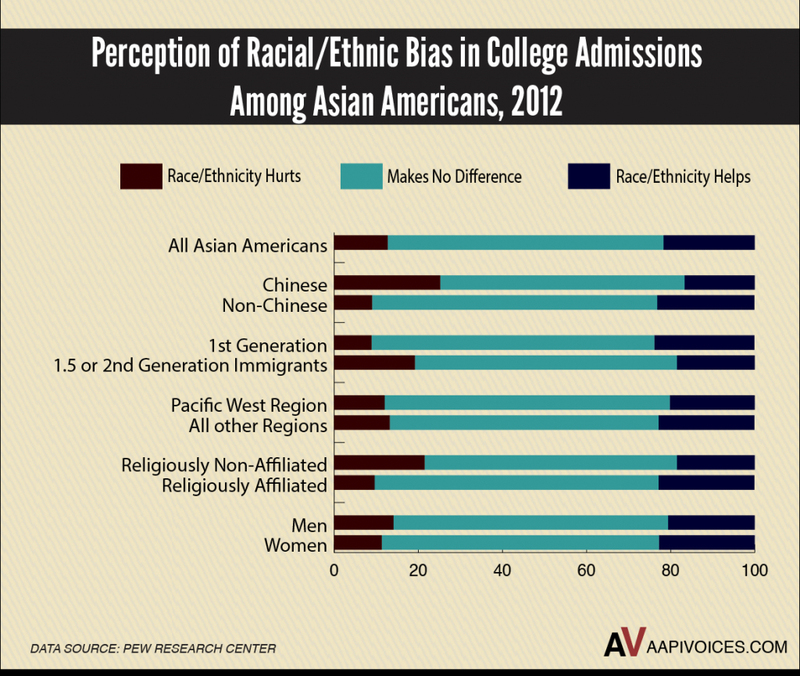 Responding to the concern that early versions of the National Asian American Survey had failed to focus on the college admissions process, APIAVote and Asian Americans for Advancing Justice-AAJC released initial findings this year showing that more than 60% of Asian Americans support race-conscious affirmative action even when the question scope was limited only to college admissions; this finding was corroborated by the independent group Asian American Decisions (results shown above) and was consistent with earlier, more generalized studies. Going one step further, Associate Professor Jerry Park and PhD candidate Joshua Tom today released the hotly-anticipated detailed report of their 2014 national APIAVote/AAAJ-AAJC survey of Asian American political attitudes regarding affirmative action. Again, they found >60% support for affirmative action among surveyed Asian Americans in all three polled sectors: college admissions, jobs or business contracts. Asian American women were more in favour of affirmative action in college admissions than Asian American men, perhaps reflecting the strong gains also made by female students in integrating traditionally male-dominated college campuses thanks to affirmative action policies. 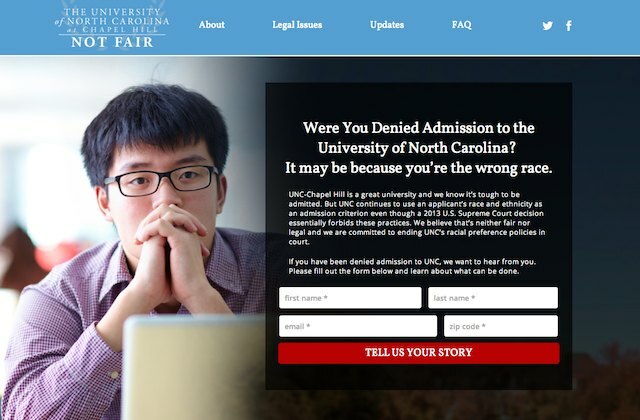 Yang, Wong, and other detractors of affirmative action such as conservative lobbyist Edward Blum (architect of the recent anti-affirmative action lawsuits against Havard and University of North Carolina-Chapel Hill) argue, however, that these surveys don’t reflect widespread attitudes among Asian Americans regarding how affirmative action in college specifically disadvantages their admission prospects. Instead, they and others cite the problematic data of Richard Sander or misinterpret the findings of Thomas Espenshade to fallaciously conflate legitimate fears of potential negative anti-Asian action in some college admission processes with race-conscious affirmative action. Specifically, Blum et al. argues that Asian Americans widely oppose affirmative action because they know it hurts their own college admission prospects. Turns out that Blum et al. are wrong — really, really wrong. Based on new analysis of a poll conducted in 2012 by the nonpartisan Pew Research Center, over 80% of Asian Americans believe that consideration of their race or ethnicity either helps their college admissions prospects or, for the vast majority, that our race or ethnicity simply makes no difference in receiving a college acceptance letter. Only 18% of Asian Americans in this national poll believe that consideration of their race or ethnicity via affirmative action hurts us in college admissions. Park and Tom went on to cover their bases and ensure that pooling national respondents wasn’t also obscuring some specific subset of anti-affirmative action Asian Americans. Geography, for example, might be a factor: the numbers might conceivably be skewed by Asian Americans living in California where race-conscious affirmative action has been abolished by Proposition 209 at UC schools to deleterious results for campus diversity. Yet, consistent with how West Coast Asian Americans responded, Asian Americans living outside of the Pacific West were also more likely to respond favourably (or neutrally) that racial or ethnic considerations were not harmful in college admissions, not less likely as as might be predicted if there were widespread belief in affirmative action causing harm to Asian American college applicants who apply to schools with the policy intact. There was also no gender disparity in response pattern. Coverage of anti-affirmative action protests earlier this year in California also seemed to focus heavily on Chinese American and South Asian American perspectives, leading to the hypothesis that perhaps anti-affirmative action attitudes might be more prevalent in these communities. Chinese Americans are well-represented in the UC system and in many elite schools, and this fact was cited as (some kind of) evidence for why anti-affirmative action positions are supposedly widespread among Chinese Americans. (Incidentally, Park and Tom are quick to remind us that Asian Americans are actually not massively well-represented in higher education when taken as a whole.) Anti-affirmative action lobbyists additionally targeted the Chinese American community by forming comparisons between affirmative action and historically anti-Chinese legislation, further fomenting anti-affirmative action fears. A screen-capture from a letter penned by the 80-20 Initiative to its supporters. APIAVote/AAAJ-AAJC report that, in actuality, among Chinese Americans, the belief that racial or ethnic considerations negatively impact college admissions is also markedly low — although marginally higher than for the Asian American population at-large. Only 23% of Chinese Americans think race-conscious affirmative action hurts our chances during college admissions; more than 75% of Chinese Americans either think their race helps them or makes no difference. Efforts to end affirmative action based on perceived unfair practices of very elite schools is misleading and serves the interests of a few at the expense of the many. Please join me in taking a stand against the thinly-disguised co-optation of Asian Americans to launch a new Rightwing attack on affirmative action and people of colour. Roughly 7 out of 10 Asian Americans support affirmative action, and further 8 out of 10 do not think that affirmative action hurts our college admission prospects. To say that Edward Blum’s lawsuits are “out of touch” with the Asian American community would not be an understatement, it would be a statement of pure fact. Please sign this petition by 18MillionRising opposing Edward Blum and his divisive lawsuits, and share this post and your own support of affirmative action to #BlockBlum and #IAmNotYourWedge. Next Next post: Mark Wahlberg’s victim clarifies the record & forgives actor – but is it enough?